This lovely disc from lutenist Richard MacKenzie on Magnatune is an exploration of a repertoire which was almost entirely new to me. 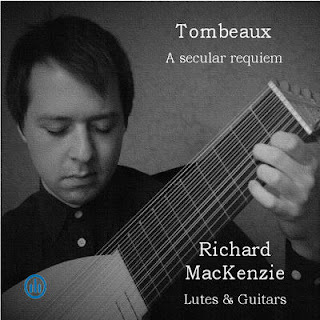 Under the title Tombeaux: A Secular Requiem MacKenzie presents a sequence of mainly French 17th century tombeaux, memorial pieces for lute. We have music by Francis Pilkington, Anthony Holborne, Jacques de Gallot, Ennemond Gaultier le vieux, Denis Gaultier, François Dufault, Francesco Corbetta, Robert de Visée, François Campion, Gallot d'Irelande, Georg Gebel and Tobias Hume. The music is mainly 16th century, stretching from 1605 right through to 1738. Many of the composers were simply names to me, and their pieces generally explore a small group of dance forms, the pavan, courante and allemande, with the occasional gailliard and sarabande. MacKenzie enlivens things by playing the music on four different instruments, a Baroque lute, a Renaisance lute, a Baroque guitar and a theorbo. The result provides some interesting timbral contrasts, with some instruments providing a remarkable depth of tone. The disc is recorded quite closely, so that we get quite an intimate experience of what can be relatively quiet instruments. There is still plenty of air round the sound, so the results are very appealing but with an interesting meatiness and bit to some of the textures. The music is generally grave without being overly sombre. The pieces are usually dedicated to a deceased person, and clearly there was a general style deemed suitable for evoking them in music. But within this there is a lovely variety, and the whole has a sense of affecting melancholy yet with an engaging sense of character, particularly in the movements where the dance form is more overt. Some seem to stretch things somewhat, and I was fascinated by the occasional Spanish sounding touches, though this might simply be the result of MacKenzie's playing piece on the Baroque guitar. Beyond this, there is remarkable variety in this music and MacKenzie has crafted a pleasing and engrossing whole. Meditative and beautiful without too much overt sadness, and an elegant sense of melancholy. The space for liner notes is rather restricted, and it would perhaps have been a good idea to make more information available on-line. Having heard this music, you wonder who these composers are and where they come from. The disc is dedicated to MacKenzie's late father, and I can think of no finer tribute. Available from the Magnatune website.